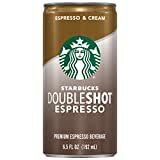 Starbucks Doubleshot is canned coffee beverage branded by Starbucks but produced by PepsiCo. It is a blend of Espresso and cream that is served in an RTD (Ready-to-Drink) can. 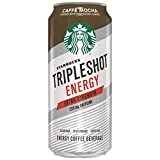 They also offer a light version at 70 calories but with 120 mg of caffeine, a Cubano version with 85 mg of caffeine, and a Salted Caramel version with 70 mg of caffeine. Starbucks also serves Espresso coffee in either one or two shots (called solo or doppio). 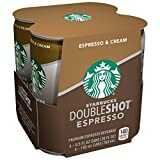 The caffeine content of a double shot espresso at Starbucks is around 150mg. Look here for the caffeine content of all Starbucks beverages. 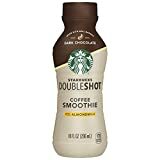 Non-fat milk, brewed espresso coffee (water, coffee), cream, sugar, caramel color, ascorbic acid, tripotassium phosphate (150 Calories). Sugar content: 17 grams (per 6.5 ounces). 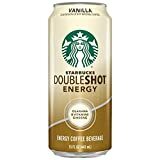 Starbucks Doubleshot contains 16.92 mgs of caffeine per fluid ounce (57.22mg/100 ml).